Without sounding cliche, it really is hard to put into words how delicious the sticky rice and mango is at Kao Neoo Korpanich. 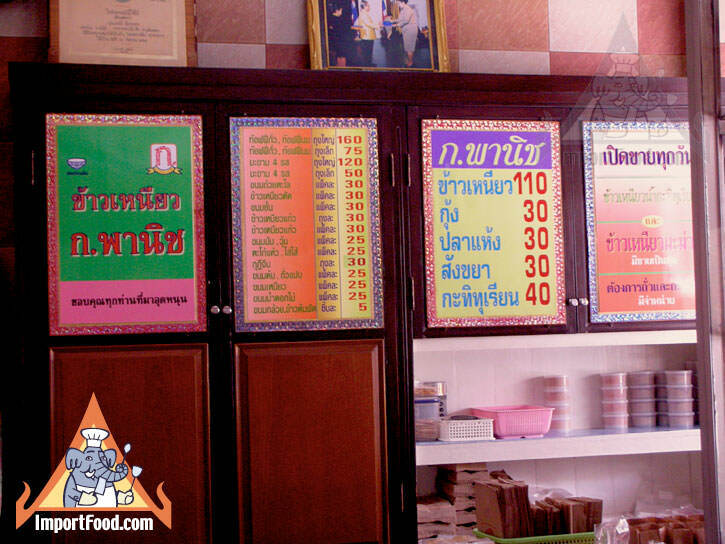 To start with, the family has been making sticky rice with mango at the same location since 1932 (75 years), and even today their menu consists of the same specialty. How good is it? Well, we can guarantee you've never had better sticky rice with mango. It's so ridiculously good that we plan trips to Thailand just to go here. As you may expect, this place is quite famous. Based on our understanding, they use a certain variety of sticky rice called "Kao Neeo Keo Ngoo" which means "snake fang sticky rice". 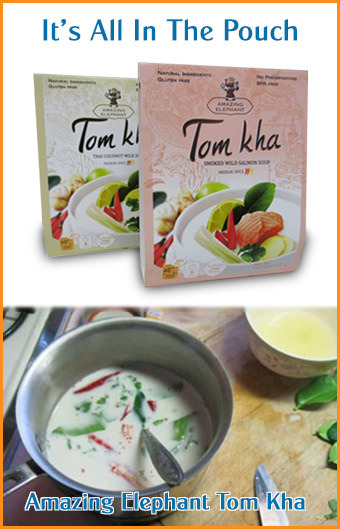 This is recognized as a rare, premium variety of sticky rice that's ideal for desserts. Korpanich cooks it to perfection. 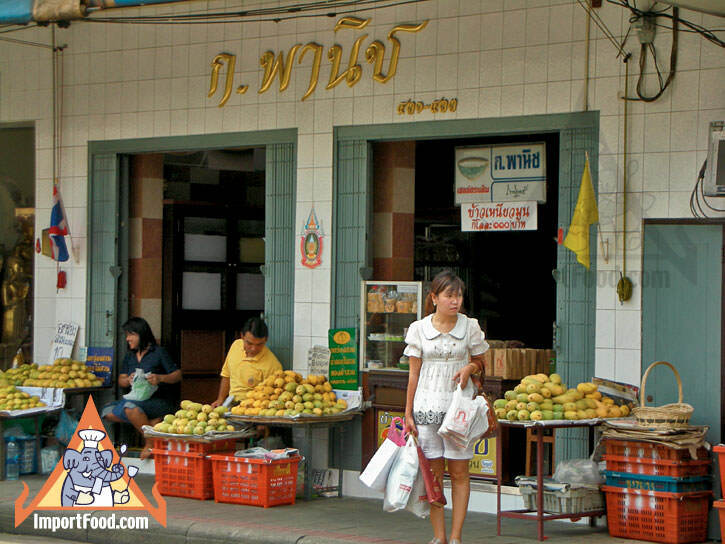 As you can see from the picture at top left, the front of this shop has a huge selection of fresh mangos, sold by a separate partner who specializes in mangos. On the day we visited, they had "oak wrong" variety which is a pure sweet and juicy variety, perhaps the most famous and expensive variety of mango in Thailand. Also available was "nam dokmai" variety which is known as a more fragrant mango, and firm (less juicy, and less sweet than oak wrong). The other variety of mango was "Tong dam" which is a less expensive mango, and a bit sour. You can choose a mango from the front yourself (we recommend oak wrong variety), or simply order sticky rice with mango and the staff will choose one for you. 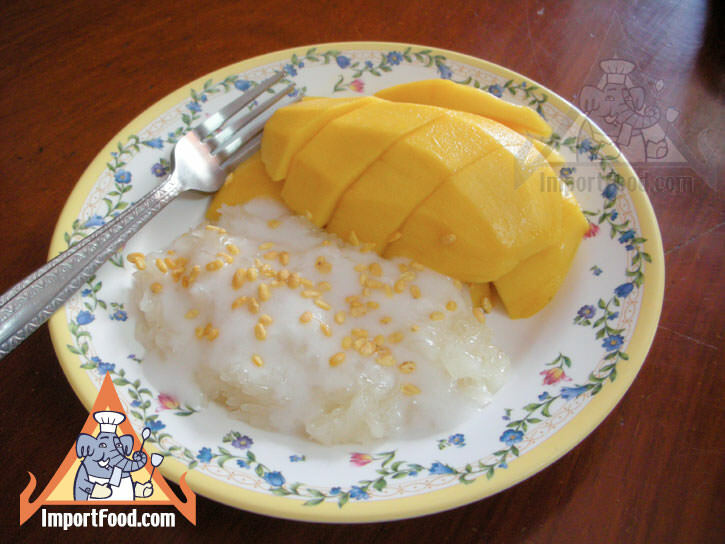 The mango is then peeled and sliced in the immaculate kitchen, and served with sticky rice and coconut sauce as you see in the picture below. The shop is very small, but a knee-high teak table in the front has small chairs underneath, and you can sit there & eat. Note the busy scene out front, as they sell half-kilogram servings of sweetened sticky rice in takeaway paper bags (with distinctive red logo). They have Shell Shuan Shim signs, and distinctive gold letters above their doors (see pictures). 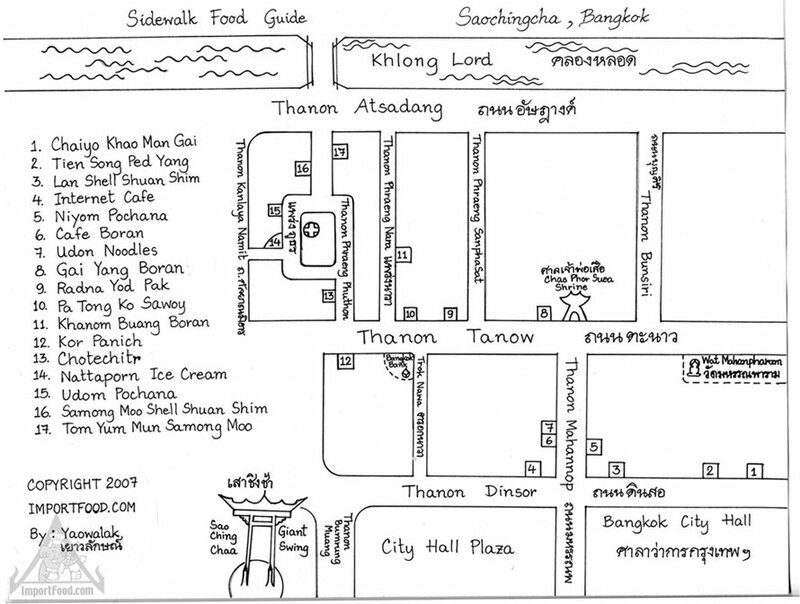 The address is 431-433 Tanao Road, Saochingcha, Bangkok. Phone 02-221-3554. They are open June through December only, to coincide with availability of the best fresh mangoes. Open 6:30 AM - 7:30 PM, Mon-Sat. Closed on Sunday. See our free map! Or Click Here To Download The Free Map in PDF format.